Due to this renovation project, the existing small business was required to demolish approximately 3,700 square feet of the existing building. 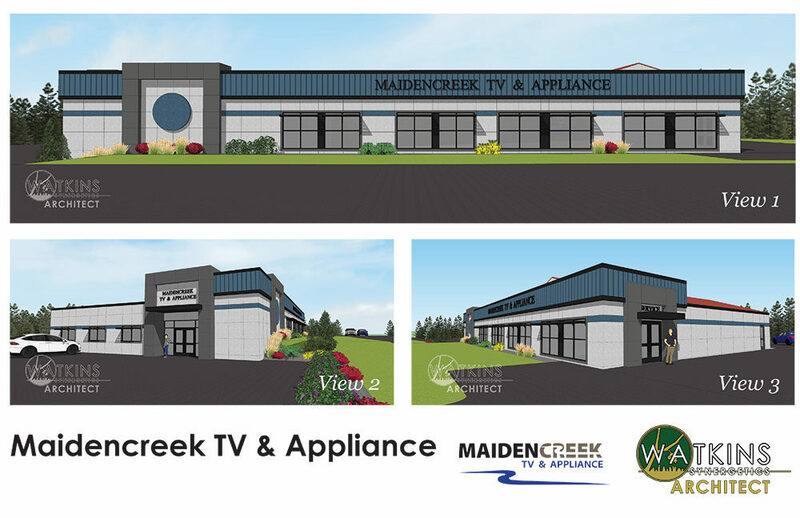 With this happening, here at Watkins Architect, we created unique additions to the existing building along with an update of the façade to have it be a modern look as well as to preserve the Maidencreek TV & Appliance appearance and name. Along with the additions, additional interior renovations were created to increase the usability of the existing building square footage. While these changes may not always be welcomed at first, they can give you the opportunity to give your business a facelift and renovations to better your business. We have assisted many small businesses to design renovations that in the end were appreciated by the business. Instead of going into a change with resistance, embrace the change and look at it in a positive light. This would give you the opportunity to possibly update the façade of your building, revise the layout for a better workflow, or alter colors and the appearance. Utilize it as a positive step for your small business! Whether you are in retail, the corporate world, restaurant and hospitality or even a school, here at Watkins Architect we can assist you with your project! We have the knowledge and experience you need by your side. Take a moment to review some of our past projects in our portfolio section, and contact us today to schedule a consultation to discuss your renovations and changes for your business.